With an average of 115,000 weddings each year, Las Vegas is considered the wedding capital of the world. That’s right, Vegas is THE go-to destination for couples looking to tie the knot. Whether you would like the traditional wedding or a uniquely-themed wedding, Vegas has it all. Some couples choose to say their vows in the many wedding chapels located in Las Vegas. There is the Viva Las Vegas Wedding Chapel, the Graceland Wedding Chapel and the Chapel of the Flowers to name just a few. For couples that prefer an outdoor wedding, options with breathtaking views are endless. There’s the Grand Canyon, Lake Mead, Mt. Charleston, Red Rock, Spring Mountain Ranch or the Springs Preserve. For themed nuptials, there are Elvis-themed weddings, Star Trek, underwater weddings, ceremonies that take place next to the famous Las Vegas sign and even Eiffel Tower or Gondola weddings. Many brides and grooms-to-be prefer a luxurious wedding day. From the Four Seasons wedding packages to the five-star treatment at the non-gaming Mandarin Oriental and the magnificent Wynn or Encore Resorts, Las Vegas can deliver luxury better than any destination in the world. 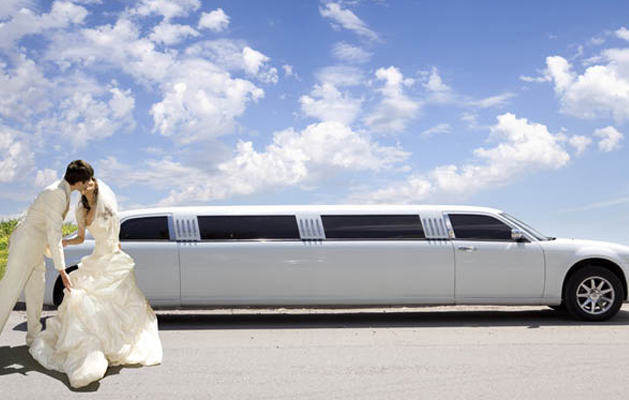 Earth Limos & Buses recommends pairing your wedding with one of our white bridal limousines. Your aptly-dressed and polite chauffeur will be punctually waiting to take you to any of these wedding locations safely, stylishly and on time!